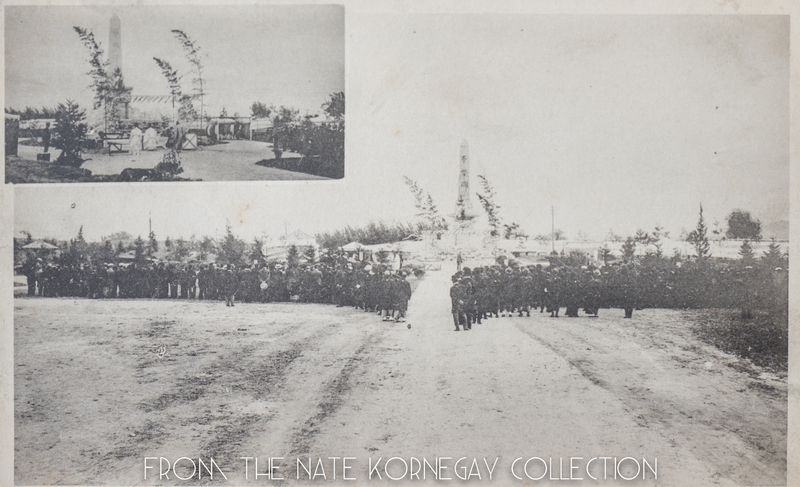 The birth of Korea’s railways has been commented on by a number of Westerners living in Korea, including missionary doctor and US minister Horace Newton Allen. In his 1908 work Things Korean, Allen seemed to be rather proud of the American gauge railroad system in Korea, claiming he had heard “prominent Japanese deploring the fact that they have not the same system in Japan.”1 However, it wasn’t just the American system itself that stirred local envy. The complicated political climate in the years between the Sino-Japanese War and the Russo-Japanese War was one that often left Japanese settlers to fend for themselves, using whatever political (and non-political) means they could in order to financially compete with the growing number of other foreign businessmen (particularly Chinese).2 These Japanese merchants, along with some imperialistic military men, were then increasingly more outspoken towards their own government about their desire for Japan to establish its own railway in Korea. Hesitant to make such a proposal to Gojong during such a tumultuous time, Tokyo did eventually respond to internal pressure from their own settler subjects living abroad, of course resulting in the eventual Japanese control of Korea’s railroads.3 Allen, being recalled from his position to the United States in 1905, never got to see what would become of the railway system,4 including the development of the South Manchurian Railway Company – a (sometimes) autonomous organization so large and powerful that it could only be called the Japanese equivalent of the British East India Trading Company. By the early 1930s, Allen was already at the end of his life. The technological advancements and infrastructure that developed up to that point were a boon for Japanese railway companies. Into Manchuria they went, and, in Korea, further support systems were established for train and railway maintenance. As the railway system grew, so did its need for employees and employee housing. More engineers, technicians, mechanics, maintenance staff, and station workers were hired to meet the growing operational requirements of such a large railway network. And with this came the advent of mass employee housing – entire planned neighborhoods that were sometimes as large as the original Joseon urban centers (or, rather, the eupseong) that they were planted next to. These neighborhoods, which by early modern standards were practically their own small villages, could be found throughout Korea and Manchuria during the colonial period next to major and minor train stations. Perhaps equally valuable in the rural interior of Korea, such facilities and residences served as important logistical waypoints for the railway system as it grew throughout the colonial period. The number of buildings and the amount of area occupied by railway employee housing was sometimes so great that US military map makers made sure to identify and label them after liberation. In Manchuria, where post-1931 urban development often oozed an aesthetic not unlike American suburbia, railway employee housing found itself in the form of rows and rows of ambiguously Euro-American styled two-story townhouses. 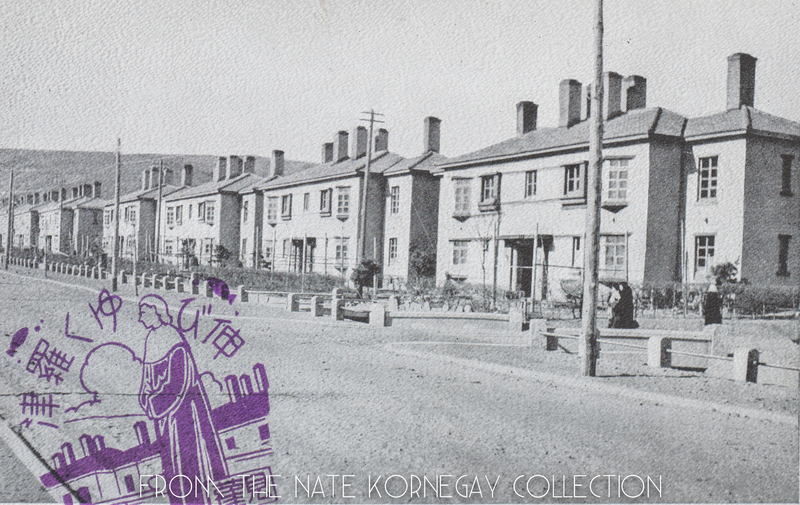 One specific example pictured here shows a 1930s-1940s postcard depicting South Manchurian Railway employee housing in what is now Sonbong, North Korea. In Korea, the anatomy of a railway neighborhood was generally simple. Generic wooden clapboard buildings of typical Meiji era design were constructed in grid form and numbered. There were always high level officials who may have gotten a better home nearby, but it does seem that these dormitories were relatively basic in southern Korea when compared with Manchuria’s. Such buildings were frequently uniform, following a basic, cookie-cutter floor plan. Despite their simplicity, there was some variation between these humble structures. In Gyeongju, these buildings sit behind the station, away from the rest of the city. This is the same for Suncheon, Samnangjin, Cheongdo, and Miryang – the example urban areas that we will be looking at for the duration of this short essay. Most of these also sat on flat land. Today in Gyeongju, a few remains from the early modern station facilities can be seen. Behind an old colonial business, an office can be seen. On the other side of the tracks, we can find many numbered railway residences with their Kanji/Hanja signs still visible. Most of these buildings have been thoroughly renovated, making them difficult to recognize to the untrained eye. Though the station itself was replaced decades ago, its concrete water tower, of course, looks much like it did back in its heyday. In Miryang, its remaining railway facilities are mostly behind the rail line (northeast). A neighborhood here exists, but its guts are hard to accurately read as its current face is so different from what it might have looked like had it had railway housing before. Despite this, I was able to find one building that I recognize as the kind of cookie-cutter clapboard structure built for railroad employees in Cheongdo (though thoroughly cemented over now). Nearby are some old, massive wooden warehouses that likely served the railway, perhaps suggesting the previous existence of more railway facilities than we can see here today. In Samnangjin, the railway neighborhood is rather unusual. Each home was built on its own elevated retaining wall. Where the Buddhist kindergarten sits today, there likely sat the area’s local Shinto shrine gazing out over the village. Aesthetically, it looks nice to have a home elevated off the ground with a clean, clearly demarcated property line. However, the only practical reason I can think to have the employee’s housing built in this way was to protect from flooding since Samnangjin is very much a river town. When we consider that other towns of greater size had much more basic railway housing, it is then a little curious to see Samnangjin with separately elevated residences. Perhaps it was merely one of the perks of working in rural Korea. Unlike these others, Cheongdo’s railway residences can be found in what would be considered the front of the station. That is to say, they are not secluded behind the rest of the current city. Like Samnangjin, the residences were built on one side of the tracks with the water tower on the opposite side. Unfortunately, there are only a couple here. Suncheon reportedly had a hundred employee residences, stuck between a mountain and the train station. Probably the largest set of colonial railway dormitories left in Korea, we can even see a very clear hierarchy of space left behind, like at Samnangjin. The higher ranking officials were probably in the homes of the highest elevation, decreasing in importance as you get closer to the station. There seemed to be a bit of variety in the designs and were elevated somewhat like Samnangjin’s, but given the road’s current construction I’m unsure of whether or not these are also on retaining walls as they may have been covered over time. Suncheon’s railway neighborhood is an example of the grand size these sometimes took as the alotted area for employee housing here roughly took up the same amount of space as Suncheoneupseong, the original fortress town that was dismantled over time. A 2012 Daum Map view of Suncheon showing what is likely the former home of a high ranking railway employee. While it might be tempting to argue that such residences must have been luxurious compared to, for example, the local chogajip, it is important to remember that the life of a railway worker was not by default an easy one. Accidents happened, sometimes resulting in the destruction of entire train stations and loss of life. (A crowd observes the funeral rites for a railway employee killed in the performance of their duties, circa 1915, Busan. Click here. From the Nate Kornegay Collection). Though some of the first settlers came of their own accord, it is unclear how much encouragement the Japanese government did or did not give in order to motivate their citizens to become railway workers. The construction of employee housing may have come out of necessity, for the Japanese government had trouble convincing citizens to move into the “frontiers” of the colonies even when offered cheap land and government support. Without railway residences, it would have been difficult to operate such a large network, leaving weak links in Japan’s logistical chain. Employee housing ensured that railroad workers would be nearby when needed. Thus, these railway neighborhoods were essential to the continuing functionality of the railway system. 1Horace Newton Allen, Things Korean, (Fleming H. Revell Company, 1908), 216. 2Jun Uchida, Brokers of Empire: Japanese Settler Colonialism in Korea, 1876-1945, (Massachusetts: Harvard University Asia Center and Harvard University Press, 2011), 43. 3Jun Uchida, Brokers of Empire: Japanese Settler Colonialism in Korea, 1876-1945, (Massachusetts: Harvard University Asia Center and Harvard University Press, 2011), 53. 4We can speculate that Allen likely became at least somewhat aware of the railway developments in Korea even being stateside. 5When I came across this place in 2015, I didn’t realize what I had stumbled upon and didn’t fully photograph it. Only later, when checking something on Daum Map, did I notice the homes towards the top of the hill. This is my reason for lacking original photos of the area and having to resort to using a mapping service’s images to show, for example, the official’s home and the circular Japanese window. 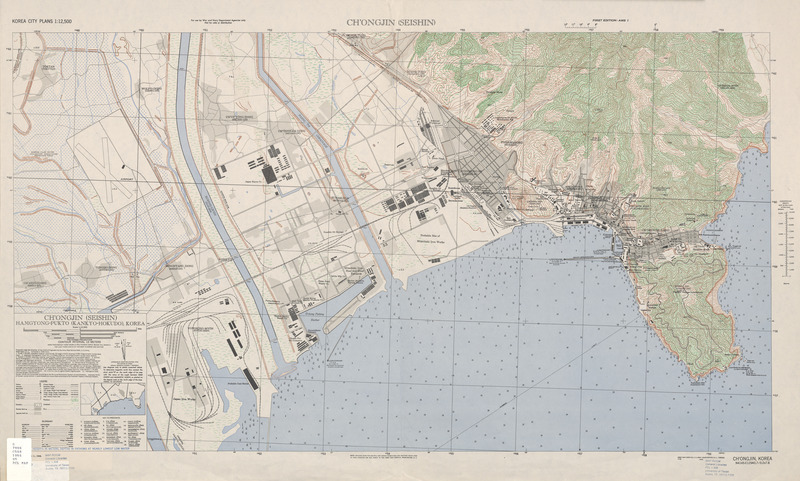 *The US Army map can be found at the University of Texas’ Perry-Casteñeda Map Collection. Click the menu icon on the left side of the map to view each area.